PREHEAT OVEN: To 400 F and prepare a baking sheet. You can use it bare or line with foil or parchment paper for easy clean up. 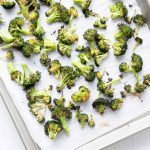 OIL + SEASON BROCCOLI: Add broccoli florets and use your hands to break apart any particularly large pieces into smaller sections. Toss in oil until evenly coated, spread them out so they lay flat and are not overlapping, and sprinkle with salt. ROAST: Place tray in oven and roast for 20 min, then remove and shuffle them around with a spatula. Return to the oven and roast for another 10-15 min or until the broccoli tops are just starting to brown and crisp up. I like mine extra crispy so I will usually roast them up to or past the 15 min mark. Then enjoy immediately! *Or any other cooking oil you like that is safe to use up to 400 degrees, I choose avocado oil because it can stand up to use in high heat situations like roasting. Check the oil you choose to make sure it will hold up to this temperature.